Clarity Haynes, Kiseok Kim, Alexandra Limpert, Alex Pimienta, David Prifti, Stuart Shedletsky, and Larry Siegel. Jeannine Bardo charms the viewer with a serene sculptural bust created from White Birch bark. A competitive triathlete, Ms. Bardo's love of sport and fascination with the human body, inside and out, informs her aesthetic. Bardo’s use of non-traditional materials to create traditional forms subtly invites the viewer to share her vision of connections between herself, nature, the human race and the world around her. In Stephen Basso’s paintings, the fanciful, yet keenly observed characters always surprise and delight the viewer. With boundless imagination, wry wit and fearless color, his paintings of faces read simultaneously as whimsical fantasies and deeply humanistic observations. A Brooklyn native, Basso's wildly imaginative artwork was inspired by numerous trips to Mexico over the past 12 years. His well-collected works combine a New York and a Mexican sensibility. He says of his work, "There is a natural surreal quality to Mexico that often collides with its harsh realities. One might call it bittersweet. It is often bawdy, but rarely vulgar, and images are everywhere. Love, hate, fear desire and of course humor never go out of style." Renowned Brooklyn artist, Simon Dinnerstein has had eighteen one-man exhibitions and has received a Fulbright Grant to Germany and a Rome Prize to work in Italy at the American Academy in Rome. Dinnerstein has been the subject of two monographs on his work (University of Arkansas Press and Hudson Hills Press). A third book is planned for early 2011 by Milkweed Editions (Minneapolis). The works in this exhibition demonstrate his mastery at balancing drama and subtlety, with the seductive finesse that followers of his work will recognize as his unique signature. Anita Giraldo presents photographic and sound artworks, activated by the presence of the viewer, from her new body of installation work, called "See My Voice." Besides her fine art work, she has a broad professional background, including illustration, design and commercial photography. Ms. Giraldo has projects in areas as diverse as Ohio, The Netherlands, Germany, Oklahoma and the Gulf Coast . She is the recipient of grants from the New York State Council for the Arts, the National Endowment for the Arts, a fellowship form The Puffin Foundation, and a museum commission for the Columbia County Historical Society, Kinderhook, New York. 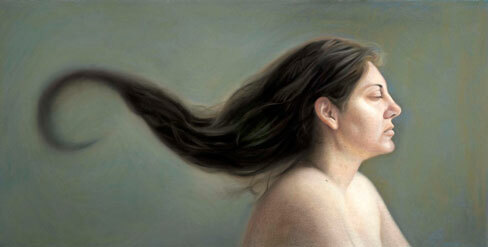 Clarity Haynes' pastel profile of a woman with a flying train of hair transcends her straightforward description and technical mastery to suggest a mysterious narrative. Ms. Haynes received her MFA from Brooklyn College, a bachelor's degree in Film Production from Temple University, and a Certificate in Fine Arts from the Pennsylvania Academy of the Fine Arts. Her work has been exhibited nationally, and she is the recipient of numerous awards and grants. She currently teaches drawing at Brooklyn College and at Adelphi University. The oversize and sublimely painted hand-covered faces of Korean-born Kiseok Kim are breathtaking. A recent graduate with a Masters of Fine Art from Pratt Institute, Mr. Kim's sophisticated monochromatic works belie his relatively recent entry into the professional realm. Alexandra Limpert is a figurative metal sculptor and mechanical animator. Her sculpture, "I" is a steel humanoid that appears to be self-aware. Limpert exposes her process through the sparsely delineated body and welded head, hands and feet. The face reveals eyes that mysteriously scan the room. Limpert's colleague Matthew Elliott programmed the electro-mechanics to move as the viewer approaches the sculpture. Humanity is expressed unexpectedly through metalwork, motors and electronics. Limpert has a BFA from Parsons the New School for Design and has exhibited locally and abroad. She was recently commissioned to create a sculpture for Bergdorf Goodman's NY windows. Limpert 's work has appeared in Artnews, The Village Voice and American Contemporary Art Magazine. Alex Pimienta's sculpture have a powerful physical presence as well tactile qualities. His interest in art is a process of discovery, with many of the surprises resulting from an inspired use of materials. In his world, whatever is available in his surroundings has the potential of metamorphosis. The mundane is transformed into the magical. David Prifti’s haunting tintypes are created with a wet plate collodion process, in which the photographer must coat and sensitize a blackened metal plate, expose it in the camera, and then develop the image before the plate dries out. This demanding process requires a portable darkroom to be set up wherever the photographer is working. Though the process is difficult to learn, the one-of-a-kind results are extremely beautifull. Mr. Prifti has been an artist and educator for over 20 years. He holds a BFA from Massachusetts College of Art and an MFA from Yale University. His work is widely exhibited and is in numerous public and private collections, including the Museum of Modern Art (MoMA) in New York, the DeCordova Museum, and the Museum of Fine Arts in Houston. He has received grants and awards including a National Endowment for thr Arts fellowship and two Massachusetts Cultural Council Finalist Grants. Stuart Shedletsky has had a distinguished career both as an artist and teacher, with over 30 years on the Parsons faculty, and numerous solo shows, group exhibitions, representations in museums and important collections, awards, and his own curatorial work. Born and raised in Brooklyn, New York, Shedletsky studied at Parsons School of Design and the University of New Mexico before receiving his MFA from Yale University. Larry Siegel has been a photographer over 50 of his 74 years. He is known in NY photographic history as the founder of the Image Gallery (1959), the only gallery at that time in New York. Later he lived in Mexico City (1966-71), teaching and working for the 1968 Olympics (first full-time photographer hired; designed Olympic darkroom). Mr. Siegel returned to NY and founded-directed the Midtown Y Gallery from 1971 to 1981. In 1985 he left for Europe and lived in Italy several years where he taught photography and did magazine assignments for Epoca, Genius, and a Calendar for 3M Italia. He has traveled widely, frequently living in a camper. Larry Siegel received a 1979 National Endowment grant to document NY’s 14th Street. His work has been shown in the US, Canada, Mexico, Italy, France & Spain. His work is held in the NY Public Library, Museum of Modern Art (MoMA), Bibliotheque Nationale, Paris, Galerie Fiolet, Amsterdam, and private collections. Today he divides his time between photographing, teaching photography and novel writing.